There’s something about Church of Ireland people that I tend to like. The late Canon Eric Elliot, for example, whom I knew reasonably well, was as modest and Christian a man as you could encounter. There are exceptions but C of I people generally strike some sort of responsive chord in me. Maybe I’ve been lucky. The possibility of this took shape when I read how last Sunday, St Anne’s Cathedral was stuffed with Orangemen celebrating the signing of the Ulster Covenant. Now the Orange Order is, as some of us have maybe noticed, an anti-Catholic organisation. In its ordinances and in its history, it has been opposed to Catholicism at every turn. And I won’t attempt to outline the dreary repetition of Orange violence against Catholics charted in Andy Boyd’s book Holy War in Belfast. 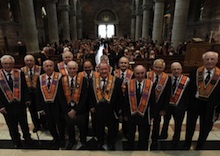 Yet here was this same Oranger Order in a C of I cathedral. Doing what? Celebrating the people who had made the signing of the Ulster Covenant a success. Because from the point of view of unionism it was a success. By threatening violence against the British state, it helped ultimately carve out the six county-state. To recap: an event which ushered the gun into twentieth-century Irish politics was celebrated by an anti-Catholic organisation in a C of I cathedral. That seems to me a long way from the gentle Canon Elliot I once knew. Another man I quite like is Micheal Martin. He’s not Church of Ireland but like Canon Elliot there’s a modesty to the man, a lack of pretension that’s appealing. As you know, he’s the leader of the Fianna Fail party which has broken its bones recently on rocky electoral ground. Maybe that’s why he was in the papers this week, talking tripe. Mild Micheal is reported as being at Arbour Hill last weekend, telling his audience that it was historically dishonest and incorrect to equate in any way the heroes who fought for Irish freedom in 1916 and in the subsequent war of independence, with the actions of the Provisional IRA. “The terrorist campaign that was waged in the North was not a clean fight”. The implication being that Easter 1916 and the subsequent years constituted a “clean fight”. Mmm. Probably the first person to be shot dead in the Easter Rising was a fourteen-year-old called Gerald Playfair. He was the son of the commander of the Magazine Fort in the Phoenix Park. He was running to alert the authorities that the fort had been seized when a pursuing Volunteer shot him dead. And the Irish Times on Monday carried an article about a historical dispute going on at present about whether in Cork in 1922, the shooting dead of 13 people, all Protestant, aged between 16 and 82 years, was motivated by sectarianism. Now you might say no amount of historical revisionism, wilful amnesia or media indifference could change two brutal facts such as those above, or other brutal events that happened during Easter 1916 and the war for independence. But you’d be too late about saying any such thing, because that’s what Micheal has already said at Arbour Hill. He condemned the Provisional IRA campaign as being “unclean” and concluded with - yes, you guessed it: “No amount of historical revisionism, wilful amnesia or media indifference could alter that fact”. So you see, it’s a mistake to assume that because someone is mild and friendly that they’re not prepared to fly in the face of historical fact if they believe it suits their purpose. The Church of Ireland has always been happy to provide a friendly home for Orangeism, Fianna Fail, who have rediscovered that they’re “the republican party” has always been desperate to deny any “old” IRA/Provisional IRA continuity. So I’m glad I knew Canon Elliot but I’m sorry he belonged to a Church that aligns itself with an anti-Catholic organisation. Just as I like the Cork mildness of Micheal Martin but I’m sorry he’s keen to gloss over the acts of brutality that are a feature of any armed conflict.